One-day conference on the history and sociology of the kibbutz and how its future might play out in a high-tech, capitalistic Israel. 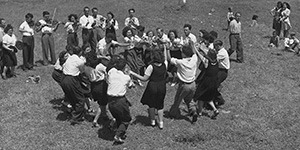 The program comprises two panels of U.S. and Israeli scholars and authors, addressing the cultural and social dimensions of the kibbutz and its future. Moderators: David Biale, Emanuel Ringelblum Distinguished Professor of Jewish History, UC Davis; and Diane Wolf, professor of sociology, UC Davis. Also participating: Rafi Grosglik, visiting assistant professor and Israel Institute teaching fellow, sociology and Jewish studies, UC Davis.